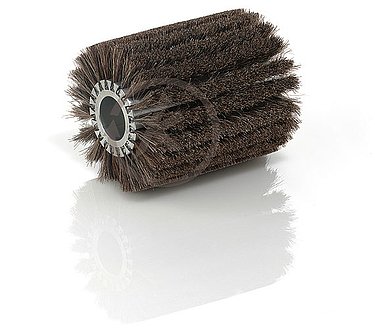 The KULLEN roller brush type 350 is one of our "highlights" as it consists of a lightweight aluminium core with horizontal grooves where strip brushes are fitted in.Two standardized aluminium cores are available:For our brush type 350/54 with 20 horizontal grooves,which means the brush consists of max. 20 strip brushes around the circumference.For our brush type 350/85 with 36 horizontal grooves, which means the brush consists of max. 36 strip brushes around the circumference. The fill configuration is either dense (EC1) or light (EC2) which means an axial strip configuration.You can use almost alll type of fill material except synthetic bristles exceeding dia. 0.60 mm and wires exceeding dia. 0.20 mm. - either with standard bore (AL 31 resp. 60 mm) to be seated on a primary shaft. - or with reduced bore by bushes to be seated on a primary shaft.